When it comes to the effect of company size on the salary you are going to earn, there are two mutual exclusive lines of thought in the discussions with our peers. One says that the bigger your company is, the larger your paycheck will be. The other says that bigger companies actually pay less compared to the smaller ones, because they expect their staff to accept a lower pay, because they are compensated by non-material assets, like working for a big brand that makes you look good with your friends and family, on your resume and for potential other companies. 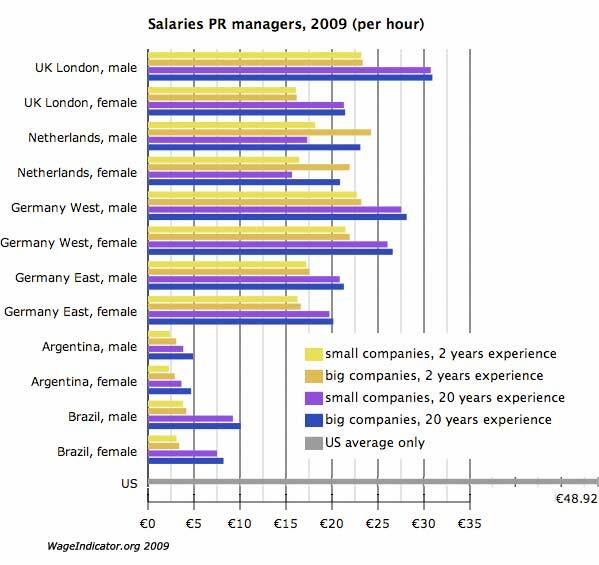 At the WageIndicator we picked today the data we have on PR managers in half a dozen countries and compare them, so we can look which of the theories might be valid. We looked at the UK, the Netherlands, Germany (East and West), Argentina and Brazil. We have a few data also from the US. First conclusion for this one occupation in a limited number of countries: size does not matter that much, not positive, not negative. The only big exceptions are Argentina, where PR managers of larger firms get about 20 percent more than those in smaller companies. In the Netherlands the difference is even larger, about 30 percent. We compared also the effect of experience for managers with respectively two and twenty years of experience, and as expected almost everywhere experience is seen back in the paycheck. In Brazil the difference is even more than 50 percent, an exceptional high difference. Again in the Netherlands, where there is no shortage in data to validate the figures, the younger PR managers tend to get more than the more experienced once. But that really is an exception. As expected, apart from again Argentina as in the previous comparison for economists, women get paid less than men, although in Germany where the average gender gap is twenty percent, the difference between male and female PR managers is much smaller. Best advice for qualified PR managers to get a better salary: move to the US. Our figures for the US (Washington area) are from 2008 and the financial crisis might have done some damage by now, with an average of almost 49 euro per hour, they earn even much more than even their colleagues in London, who earn 30 euro per hour for the more experienced PR managers.